In Australia, Aboriginal and Torres Strait Islander peoples are under-represented in the legal profession and over-represented in the justice system. In 2011 Herbert Smith Freehills was the first law firm to join the CareerTrackers program, which places Aboriginal and Torres Strait Islander university students with corporate partner organisations for 12 weeks each year to help build skills and confidence for a career in the private sector. The program is designed to address the systemic disadvantage of Indigenous Australians in private sector employment. The career path of CareerTrackers intern Aaron Lowth demonstrates the difference that this strategic program can make, not only to the professional path of the intern, but to the culture of the host law firm. In May 2018 Aaron Lowth completed six and a half years of intensive study, finishing the dual degrees of law and social research and policy. Aaron began working as a summer intern at Herbert Smith Freehills during his second year of university, as part of the CareerTrackers program designed to build skills and confidence for a private sector career. During a series of internships from 2013-16, Aaron worked on rotation with several different teams. In his interview with Brooke Massender and Rebecca Benfield, Aaron recalls saying he would really like to work in the area of big developments and construction. That said, “At that time I didn't know in seven years I'd be wholly immersed and working in the construction industry,” he said. During his internships Aaron experienced two secondments. The first was to Clifford Chance, which was considering joining the CareerTrackers program at the time. In the spirit of leadership, Herbert Smith Freehills considered the secondment a perfect opportunity to give another law firm insight into how the program works, and to give an intern an experience of another firm. Soon after Aaron's secondment, Clifford Chance joined CareerTrackers. In 2015, Aaron won the CareerTrackers Community Spirit Award. Aaron's next secondment, with Lendlease, proved decisive for his career. He spent two weeks in the Building Legal Team, which soon afterwards offered him a job as a paralegal which included working on procurement as part of the construction of the Crown Sydney Hotel Resort project located at Barangaroo. Aaron maintains that participation in CareerTrackers goes a long way in changing the culture of a firm. “For a lot of firms it's the first step - they haven't employed an Aboriginal person before. We're changing the face of law firms to be more representative of the community,” he said. Aaron also believes that there's a bigger effect at the level of the legal industry as a whole. “My ATAR wasn't enough in a conventional sense to get me in the door [of a top-tier law firm], but CareerTrackers and Herbert Smith Freehills gave me an opportunity. Such programs go a long way to showing that success is not always attributable solely to marks. Aaron was awarded the CareerTrackers Gold Diary recognizing his academic excellence in his university studies, as Aaron completed his combined degree with a 73.85 average. Aaron is now in full-time employment with Lendlease Building as a Contracts Administrator on the Crown Sydney Hotel Resort project, working with and managing the commercial aspects of the sub-contract packages for the basement part of the building. He attributes his professional direction to CareerTrackers and Herbert Smith Freehills. He clearly sees the skills that his time as a CareerTrackers intern at Herbert Smith Freehills honed. “The job I do now requires the combination of risk analysis, commercial acumen and strong communication skills such as understanding the needs of the clients; working on complex construction methodologies; being able to work independently and do research. When you go to an in-house environment, while you're given supervision and mentoring you’re also given a lot of breadth and independence to develop and grow. Herbert Smith Freehills gave me the skills to take into the in-house environment at Lendlease, then into my commercial experience at Crown. Herbert Smith Freehills' partnership with CareerTrackers is central to the firm's Reconciliation Action Plan (RAP) strategy, reflecting a commitment to skills development and employment opportunities for Indigenous Australians. Under a 10 year agreement with CareerTrackers, Herbert Smith Freehills committed to being their primary provider of pro bono legal services, to support up to 10 interns per year, and to provide capacity building within the organisation. 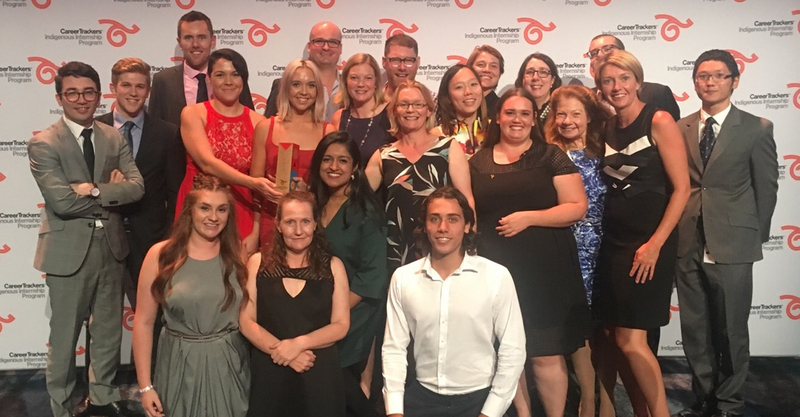 In 2016, CareerTrackers recognised Herbert Smith Freehills with the CorporatePlus Award, its highest accolade for a business advancing opportunities for Indigenous people. Michael Combs, Founder & CEO, CareerTrackers Indigenous Internship Program.